Pushkar Resorts offers a variety of cuisines ranging from traditional Rajasthani to European and continental. The focus is on the use of fresh home grown ingredients which ensures that the dishes are fresh and healthy. 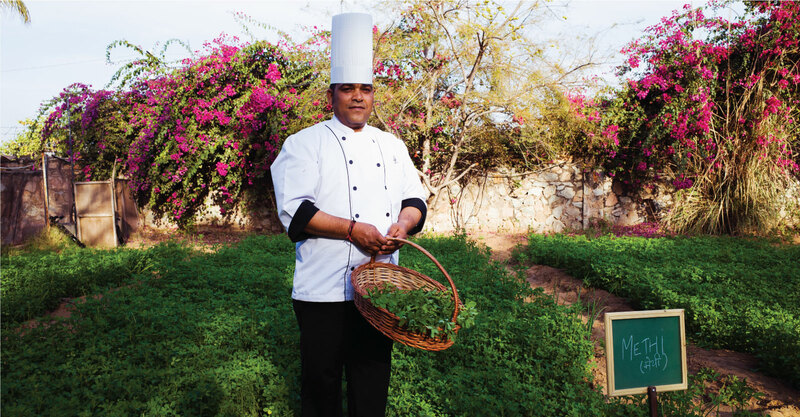 Produce like lettuce, mangoes, cherry tomatoes & amlas are grown in-house and used for the daily preparations. With a cover of 100 seats, the restaurant serves breakfast, lunch & dinner with regular chef specials and food festivals. Special picnic baskets are also provided for the kafila rides. We also provide a healthy menu option to compliment the spa treatments ensuring an overall healing of the mind, body & soul. Pushkar Resorts is one of the few resorts in the vicinity to offer non-vegetarian delicacies and alcohol. Signature dishes like dal makhni, laal maas, choorma laddoo and gulab ki kheer are a must try on your visit to the property.